Anyone else super excited about the 2019 Color of the Year, Living Coral? Pantone sets the trends each year with their announcement of the Color of the Year, and I’m actually super on board with this one— though not sure if anything can top last year’s Ultra Violet as a purple lover, myself! Either way, coral is an awesome shade when it comes to working it into your beauty looks, especially as Spring and Summer roll around! 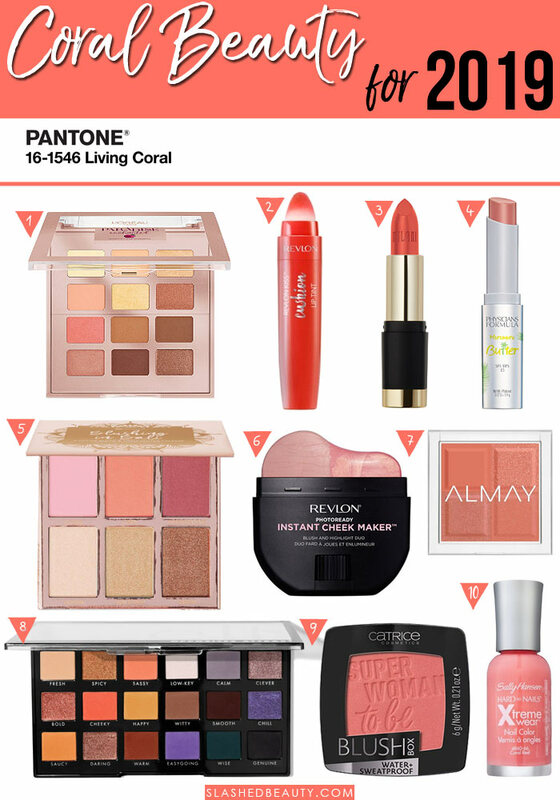 Living Coral is a bright and happy medium between pink and orange that leans warm with a “golden undertone.” Here are a few ways you can add living color to your makeup and beauty routine! Click the picture of the product to find it online. Since Living Coral is very close to a peach shade, I can expect even more popularity in the peach makeup trends that were big in 2018. This eyeshadow palette from the peach-scented L’Oreal Paradise collection features a beautiful coral shade among other neutrals to create a perfect color-of-the-year inspired look. I’m a huge fan of these lip tints— you can see my full review of them here with swatches https://slashedbeauty.com/revlon-kiss-cushion-lip-tints-review/ . High End Coral is literally the perfect Living Coral lip color. It matches its vibrancy and golden hue, and the formula is great, too. If you’re more of a matte lipstick lover, these lipsticks are new on the scene and feature a shade called “I Am Happy,” a warm coral. While you get a matte finish, the formula contains Monoi Oil for hydration and the color payoff is intense. Want something more balmy? The new Murumuru Butter Lip Creams from Physicians Formula are the way to go! Made with the brand’s signature butter blend, plus fatty acids and provitamins to condition the lips, these not only add a beautiful wash of color but will leave your lips silky soft. Guava Mama is a soft coral perfect for this year’s color trend. Another great way to add coral to your makeup look is as a blush shade! This blush & highlighter palette from BH Cosmetics is an especially good value, with 6 shades total—including a bright coral— you can mix and match depending on your preference. This new one-swipe beauty product lets you blush and highlight in one step! This 2-in-1 blush and highlight stick applies both products at once to add color and glow to your look. Simply blend with a sponge, brush or even your finger tips! Choose the shade Sweet Coral for a warm golden flush of pink. The Almay Shadow Squads are monochromatic eyeshadow quads that feature the same shade in four different finishes. Unapologetic gives you a coral color in matte, shimmer, metallic and satin finishes. One of the brand’s most popular new releases, the e.l.f. Opposites Attract palette is an awesome balanced palette full of variety. It features two coral shades: Cheeky and Sassy. This velvety powder brush is waterproof and sweat-resistant, and gives you major pigmentation. Golden Coral is the perfect warm coral that will look great across skin tones. Want to rock the color of the year in a different way? Your nails are perfect if your makeup preference is a little less bright. Coral Reef is a shade that’s a bit more pink than Living Coral, but still gives you the same beachy vibe.